The hideous Professor Pyg and his deranged dolly followers have Robin trussed up like a pig, while Batman does his best Marv from Sin City impression in interrogation (you'll get the reference on the first page of this awesome comic). 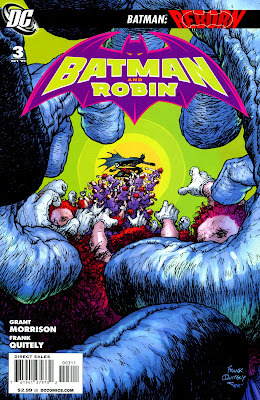 Three issues in and Batman & Robin is simply a joy to read - that is all there is to it. I want to be entertained, I want the Good Guys to get the Bad Guys and I want to look at great art. Well, this title has it all. Does it matter that Bruce Wayne is not the Batman at the minute? Not at all - this Batman is intriguing, mixing street fighting and acrobatics with trying to keep a teenage partner on the team. Robin, precocious, angry and vicious, never outstays his welcome on these pages. In fact, nothing outstays its welcome on these pages. Verdict. What a great advert for the comic book. 9.5 out of 10.